When an invitation came in to visit Villa Sandi in the Veneto it was intriguing on two levels: the first was that since I last visited the estate in 2009, they have picked up an unbroken string of ‘3 bicchieri’ awards from Gambero Rosso, the highest accolade dished out by Italy’s most influential wine guide. 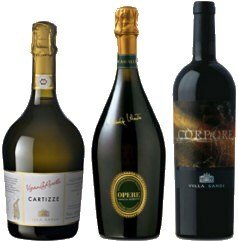 The awards have been for their top Prosecco, a single-vineyard wine from the hill of Cartizze. The second point of interest was that I’d be travelling with renowned chef Theo Randall to look at matching the wines with regional cuisine, a prospect potentially too delectable to miss. Villa Sandi is a substantial producer, best known for its Prosecco, but also producing traditional method sparkling wines and still table wines to the tune of four million bottles annually. The great bulk of this is Prosecco, but I would also taste their traditional method wines made from Chardonnay, Pinot Noir and Pinot Blanc (which have a minimum of 36 months secondary fermentation in bottle), and their still wines made from Pinot Grigio and Merlot. Stefano Gava, Villa Sandi’s oenologist, led the tasting. He explained that their Prosecco falls into three basic bands: wines bottled as DOC Prosecco come from the flatter vineyards, not the hills between the towns of Conigliano and Valdobbiadene. Those hills form the second band: the superior DOCG of Conegliano-Valdobbiadene. Finally there are wines labelled Cartizze, from a specific area within the Conegliano-Valdobbiadene DOCG. Yields for DOCG wines are substantially lower than DOC. Villa Sandi bottles its Prosecco to order – one aspect of the winemaking process that makes Villa Sandi different from many other producers. The must is held in tanks at zero degrees, and the secondary fermentation (in Prosecco this also happens in tank – the charmat method in French winemaking terminology), and bottlings are done in batches. The use of added sulphur is low – around half the legal limit – and alcohol is always around 11.5% abv. That 3 Bicchieri winning wine is their single vineyard Prosecco from the top terroir of Cartizze. Cartizze is amongst the most expensive vineyard land in Italy, a renowned zone where 140 owners share only 216 acres. 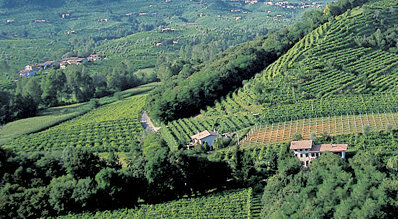 Villa Sandi is the largest single owner, and their vineyard known as La Rivetta (pictured left) sits in the middle of the Cartizze micro-zone. Their range of traditional method sparkling wines, where secondary fermentation takes place in individual bottles, appears under the label ‘Opere’. Three century-old underground cellars stretch for over 1.5 kilometres beneath the villa, creating an ideal environment for wine aging with constant humidity and cool temperature. The top bottlings of Opere spend a minimum of five years in the cellars. Though the traditional method sparkling wines of the area have not previously had their own DOC appellation, a brand new classification of DOC Serenissima has just been created, presumably to help these wines compete more evenly against the growing reputation for the wines of Franciacorta just to the west. All of Villa Sandi’s Opere wine are Brut, with between 8 and 9.5g/l dosage. The cellars also house the barrel rooms where Villa Sandi’s still wines are made, filled with oak barrels from top French coopers. All of the grapes come from the Treviso area, most from vineyards around the villa, with Merlot dominant though Cabernet Franc is grown too. The indigenous Raboso is also made as a still wine, though I did not taste it on this occasion. Run by the charming Giancarlo Moretti Polegato, Villa Sandi is a prestigious player in the Prosecco production area. The magnificent Palladian Villa Sandi (right) and the underground cellars are open to the public for free guided tours, and they run the Locanda Sandi nearby, a lovely restaurant specialising in local foods with comfortable rooms. The Polegato family also own the Geox and Diadora footwear companies, so one presumes investment in the quality of Villa Sandi will be ongoing. (2014) From the flat area outside of the Valdobbiadene-Conigliano DOCG area. Soft and pear-droppy aromas, with a lemon sherbet freshness and touch of leafy herbs that's very attractive. Gentle mousse, abundantly fresh with tangy lemon flavours and more of that fresh pear. Good acidity. 14g/l. (2014) Bottled under screwcap at a lower pressure, and with only 10% alcohol by volume, this delicately effervescent wine has a similar pear-fruited aroma and pleasant sherbetty fizz in the mouth. Again, super-fresh, just a hint of being off-dry, but lots of cleansing, fresh acidity to finish. (2014) 10g/l dosage for this DOCG wine which is slightly more intense, slightly more pungent and crisp on the nose, but perhaps not the floral exuberance of the first wine. The palate is dry with a touch of bittersweet endive bite. Racy and fresh with a core of mouth-watering acidity but enough of that pear skin grip. (2014) There's 17g/l dosage in this sweeter style Prosecco. More aromatic again, the floral aspects leaping out of the glass, with lots of fresh cut pear and peach. Seems more effervescent, a lively aspect to the mousse, with a mouth-filling richness and a peach flesh softness and hint of sweetness, but again that hint of chicory bite to the acidity that keeps it fresh. (2014) The single vineyard, multi-award winning wine also has 10g/l dosage but seems substantially richer on the nose, with a hint of smokiness and more of that herbal concentration. Not so obviously - fluffily - fruity and sweet, with a lemon pith dryness but definitely more complex notes, a hugely decisive core to the acidity and the fruit concentration giving an almost earthy quality to this. (2014) Made from the Glera grape blended with Chardonnay and Pinot Noir. Since 2009 rosé wines cannot be classed as Prosecco. Soft strawberry pink with lovely fresh summery fruit aromas and a touch of the floral aspect and pears again. The 14g/l dosage does give a suggestion of sweetness, making this soft and very easy to drink. (2014) 36 months ageing on the lees and 12% abv for this blend of Chardonnay and Pinot Noir. Lots of vanilla and brioche richness here, quite a rich style on the palate too, with plenty of ripeness to the fruit and a buttery component. Ultimately quite simple, but balanced and richly appealing. (2014) 100% Pinot that spends 36 months on the lees. A touch of copper to the colour, perhaps onion skin. Quite an oxidised style, a touch of mushroomy quality and yeasty. Really nice red fruit component and has a fine savoury aspect with lovely balance. (2014) Chardonnay and Pinot Noir that spends a minimum of 60 months in bottle. Nice hint of development, with again that buttery component and some toast. Nice sense of development in the mouth too with vanilla richness and a lightly foamy mousse. Lovely creamy weight and sense of fruit ripeness. (2014) 60 months on the lees, a blend of Pinot and Chardonnay, the latter fermented in barrique. That component has added a creaminess and almond quality, with toast and a touch of developed yeastiness and lightly earthy aspect. The palate has a delightful fresh lemon juiciness, with lovely length, then the cream and nuttiness adding more richness. (2014) Very youthful and pear-droppy still, with a little more richness on the palate from two months battonage. Nicely balanced, the acidity modest, but has a freshness and limpid quality. Nicely dry in the finish. (2014) No oak for this bottling of Merlot, and a really sweet, jammy nose showing just a touch of tomato leaf, but it remains creamy and up-front. On the palate there is a slightly dry quality to the fruit and tannins. It finishes with a slightly disjointed character, but is pleasantly savoury. (2014) 100% Merlot, this spends a year in new French oak and another in bottle. >From terra rossa soils, rich in iron. Yields are low with a green harvest and careful fruit selection. Serious tobacco and cedar nose, with plenty of depth and a bittersweet black fruit character. The palate is fleshy and ripe, filling in any the holes of the with fruit extract, ripeness and that oak. Long, savoury and nicely balanced, with soft but refined tannins and acidity.